Patrick J. Droste M.S., M.D. Patrick J. Droste, M.S., M.D. is a pediatric ophthalmologist. Dr. Droste began his medical career as a respiratory therapist at Henry Ford Hospital in Detroit, Michigan. After deciding on a career in medicine, he graduated medical school from Wayne State University in 1980. He completed a year of internal medicine followed by a 4 year residency in ophthalmology at Henry Ford Hospital. In 1985, he was named Assistant Residency Director and Director of the Eye Clinic for William Beaumont Hospital in Royal Oak, Michigan. In 1986, he completed a medical/surgical fellowship in Pediatric ophthalmology and Ocular Motility in Indianapolis at Indiana University under the direction of Eugene Helveston, M.D. and F. Darryl Ellis, M.D. Dr. Droste obtained his board certification in ophthalmology in 1986. He returned to Michigan in 1987 to begin his practice in Grand Rapids, Michigan now known as Pediatric Ophthalmology, P.C. Dr. Droste is a Clinical Professor at Michigan State University College of Human Medicine in the Department of Neurology and Ophthalmology , Clinical Professor at Michigan State University College of Human Medicine- Department of Surgery, Clinical Professor at Michigan State University College of Osteopathy in the department of Neurology and Ophthalmology, Director of Pediatric Ophthalmology at Metropolitan Hospital in a teaching capacity since 1991, past president of the Michigan Society of Eye Surgeons and Physicians, past president of the Kent County Medical Society and former Chief of Ophthalmology at Butterworth Hospital 1991-1999. He also holds active memberships and serves on many committees for the Michigan State Medical Society, Kent County Medical Society, American Academy of Pediatric Ophthalmology and Strabismus, American Academy of Ophthalmology, Lion’s Club of Grand Rapids and Spectrum Health Hospital. He is responsible for creating the Visually Impaired Sports Day which has occurred annually since 2002 in sponsorship with Spectrum Health. He was a charter board member of Project Access which provides free medical services to the disadvantaged in Kent County. His involvement with Heal the Children has allowed him to care for children of third world countries that would otherwise not receive care. He has participated in several mission trips providing eye care and glasses for children and adults. He has been an active board member and past president of Lake Michigan Academy, a school for children with learning differences. He continues to represent ROPARD, Association for Retinopathy of Prematurity and Related Diseases as a chartered board member. 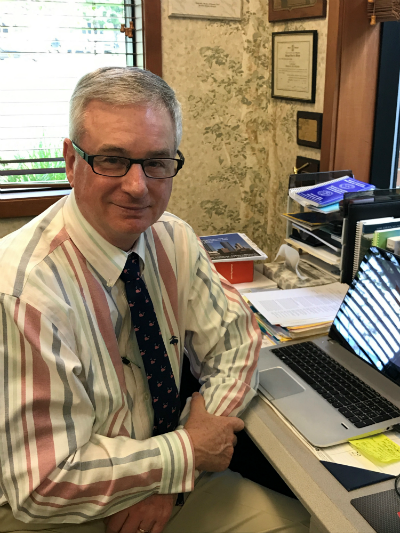 Dr. Droste has published numerous articles in peer review journals, participated in peer review presentations and courses as well as, lectured internationally. He actively participates in clinical research at the national level as a principal investigator for Pediatric Eye Disease Investigator Group (PEDIG). PEDIG is affiliated with the National Eye Institute and National Institute of Health. He is also active in research at the community level with our local hospitals. Dr. Droste is on staff at Spectrum Health, Mary Free Bed and U of M Metropolitan Hospital.